Here you find all the questions you might have about keeping praying mantids. How old can a praying mantis become? The maximum age for a mantis depends on its species. Large species generally live longer than small species. Also females generally live longer than males. When buying a praying mantis nymph, it will take between 4 and 6 months to reach maturity and when adult is will live for another 3 to 8 months. When keeping the mantis relatively cool and not feeding it a lot, its lifespan can be greatly increased. But keeping the temperature too low will result in death. Is it illegal to keep praying mantids as pets? In some U.S. states it is illegal to keep exotic species, including exotic species such as tropical praying mantis species. Endemic species of mantis are legal to keep as a pet. More about legality here. Is it illegal to kill a mantis? No, it is not. This is an old myth from the U.S.
Can a child take care of a pet mantis? Yes, it can when the child is supervised by an adult. From around 11 – 12 years old a child should be able to care for a praying mantis by itself. A younger child needs help with feeding, adjusting temperature and humidity and with cleaning and health checks. My mantis won’t eat, what is wrong with him? A praying mantis won’t eat a few days before it will shed its skin (molt). This is normal. After molting it will start to eat again. When a praying mantis will not eat even though it does not need to molt, it can help to offer it a different prey species. Do not worry too much, a mantis can live for 2 weeks without any food. How can I see if my mantis will molt soon? A few days before molting, the mantis will hang upside down and will not eat. Sometimes a white film-like layer can be seen all over the body of the mantis. This is the skin becoming more loose. 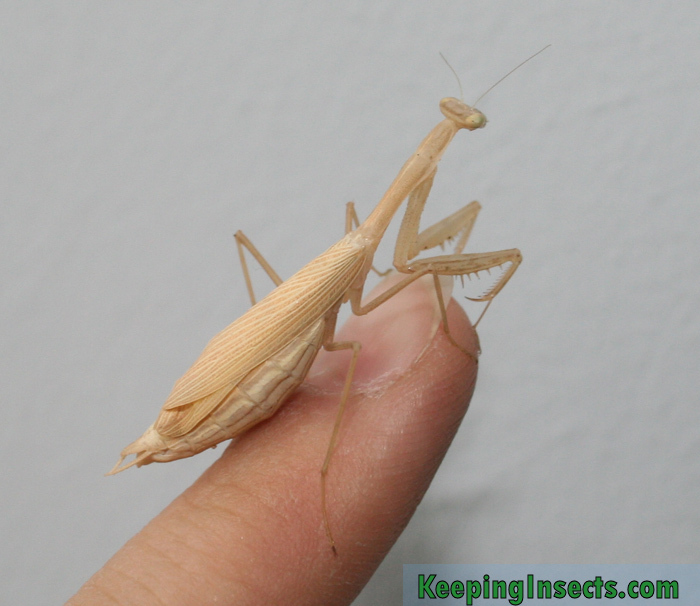 When the mantis is becoming subadult or becoming adult, you can see that the wing buds (location where the wings grow when the mantis is still a nymph) are swollen. Can a praying mantis bite me or harm me? Although it almost never happens, a praying mantis can grab your finger and bite you. This only happens if it thinks your finger is a prey item. And of course it only happens when a praying mantis is big enough to get a hold of your finger. It is very easy to get a praying mantis of off your finger and they do not carry diseases. They are also not venomous. Praying mantises do not have any poison, so even if your cat or dog accidentally eats your mantis there will be not consequences (for the cat or dog that is, the mantis on the other hand…). How do I know if my mantis is adult? For most species it is easy to see if you have and adult mantis or not: adult mantises have wings while nymphs never have wings. Some species never grow wings, also not when adult, but this is rare. The size of a mantis is not an indicator of age or maturity. Of course a mantis grows to become larger with age, but some species will reach one inch in length when adult, while others will reach 4 inch when adult. How can I see if an ootheca is fertilized? You cannot see that from the outside of the ootheca. The only way to know is just to treat it right and hope nymphs will hatch. Female praying mantids will produce ootheca even though she is not fertilized (she has not mated). These ootheca will never hatch. What’s up with this L1, L2, L6 business? Sorry about that! The L-numbers are a very easy way to signal the developmental stage of a praying mantis. It is used by biologists for many insect species. When the praying mantis is born it is at L1 level, the first instar. 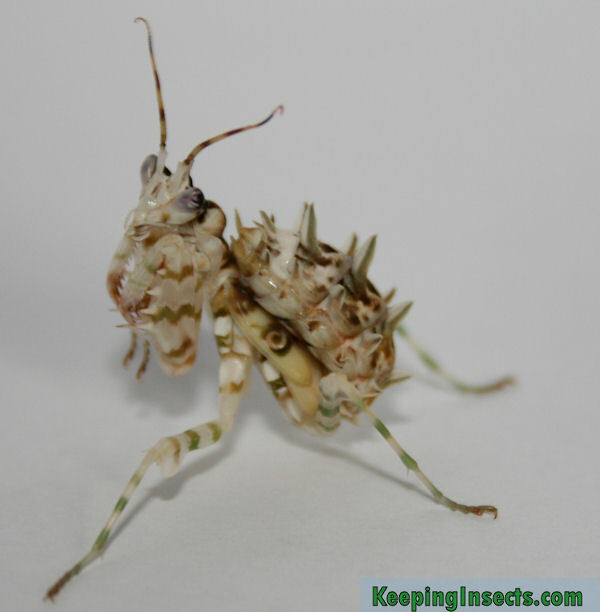 When it molts it sheds its skin and reaches the second instar, L2. Usually it looks different too. Every consecutive molt it will go up in L-number until it reaches adulthood. Then it is just called “adult”. Sometimes the second last stage will be called subadult, indicating it needs only one more molt to become adult. Previous page: Male or female mantis?